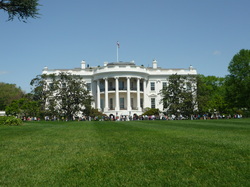 South side of the White House. Some days being a guide in Washington, DC, gives you a headache. April 29, 2013, was such a day. Alte Cocker was supposed to have a 4 hour tour with 10 people from India. Note the use of the word "supposed". I arrived at the hotel 15 minutes before the scheduled start time. You have a sense about these things. Arriving at the hotel I noticed a group of 10 people who looked as if they came from the Indian subcontinent. I approached the table and asked them if they were scheduled for a DC tour. They said they were. I then asked if they were with the tour company I was scheduled to work for. They were. Bingo, contact. I informed them the driver was outside. Tour groups generally run late, but the guide's and driver's clocks begin running the moment the tour is supposed to begin--not when the group finally arrives or announces it is ready for the tour. The tour began at 10:30am--a half hour late. If they want to waste their money, far be it for me. . . . Since this was a private tour, I asked the group what they wanted to see. Unbelievably, tourists sometimes do no research whatsoever before a tour and rely on the guide to make all the choices for them. Wrong! Washington, DC, has a lot of possibilities and you have to choose. Better you should make the choice than to have the guide make all the choices for you. The tour involved 3 families and the constant discussions of where we should go (and arguments) were totally unnecessary and wasted a boatload of time. 90% of visitors to Washington want to see the same things--the monuments and memorials, the White House, the Capitol, etc. If they leave it up to me, that is what I do--and they are always happy. The client who sort of ran the show for the others, and who I will call "Mr. Hotshot", pulled out a piece of paper with a list of all the sites of DC and announced he was promised all of it. Yeah, right. It was a list of possibilities, not definites, but he was quite insistent that he wanted to see everything on the list. So we began. Since it was raining, I asked if anyone needed an umbrella or a trash bag poncho. No, no one didn't wanted one. We went to the Capitol. There they found out, contrary to their expectations that, yes, they would occasionally be getting out of the van and it was raining. We had to go back to the store that sold the rain gear and pick it up. The last thing you want on a tour is backtracking, right? Now this was not the usual group of Americans--who tend to come in packs of adolescents or seniors. It was 3 Indian families including--get this--a 2 year old and a 5 year old. Indians travel in family groups and you can have everyone from a newborn (I kid you not) to a elderly great grandmother who spends her entire time in the bus because she can't walk and doesn't know who she is or where she is. I, quite frankly, do not understand this sort of travel, but my job is to keep them all happy. Of course, the children will never be happy because this type of intensive touring is not appropriate for young children--especially for young children who do not speak English--and can't understand a word I am saying. This is not a tour of playgrounds, folks. Mr. Hotshot decided that he had been promised a guide for the entire day. That was not the case, but the paperwork was not specific as to the number of hours. An argument began between Mr. Hotshot and Mr. Tour Company. It was an argument that continued almost all day. The gravamen of the argument was Mr. Hotshot thought the guide, van and driver should remain with the group all day for 4 hours pay. Give me a break, but the paperwork did not say specifically that the tour was only 4 hours and Mr. Hotshot attempted to take advantage of that fact. I did not need this. A tour is supposed to be enjoyable, not a constant round of arguments. I certainly did not need to be put in the middle of the mess. It did not help that Mr. Hotshot felt totally self entitled. Finally the group, decided to keep the guide and driver for the rest of the day for the regular hourly rate. I knew from the moment I met Mr. Hotshot and the grand debate over the number of hours began, that the tour would be difficult and there would be no tip. I did not know wrong. After the Capitol and the stop for rain gear, Mr. Hotshot, having noticed Madame Tussaud's Wax Museum, decided he wanted to see that. The Wax Museum is mostly an attraction for children. It costs quite a bit and kids enjoy taking photos of themselves with presidents, movie stars, rock stars, etc. I negotiated a group rate for the people--and they did not have to pay for me to enter. They spent almost 2 hours in the Wax Museum. All 44 presidents are represented--including lots of minor ones most people have never heard of. Mr. Hotshot took his photo with almost every figure. One camera battery died and the day was still young. With all the things there are to see in Washington in their one day, Mme Tussaud's? Of course, they took a boatload of photos with President & Mrs. Obama in wax (extra charge for photos with wax Obamas!). At least wasting time there gave me an excuse not to do everything on the list that Mr. Hotshot had because Madame Tussaud's was not on the list--and I could argue that, you add something, something else gets subtracted. The tour continued with stops at the White House--where they demanded to go in; they were much distressed when I said that was impossible, as the White House was on the list. I told them that that list included exterior visits only as with one day in Washington, they could not possibly include interiors if they were to get beyond one or two things. Similar shenanigans at The Capitol (which was open but takes 2 1/2 hours to tour). We did get to see the Lincoln, Vietnam and Korean Memorials and drove by Iwo Jima. A gourmet lunch was had at McDonald's (They did not pay for lunch for myself and the driver, as they are supposed to do; I ate in the van with the driver to momentarily escape the confusion). We then went to Air & Space for a decent amount of time. We had made a departure time of 4:30pm. They showed up after 5:00pm. At least that museum is well worth visiting. And then there was the grand finale: Instead of a drive along Embassy Row, they wanted to go to a store for SIM cards for their phones. What should have taken 5-10 minutes took 40 as they debated which sort of SIM to get and how to structure their minutes to call India--mindful of the fact that their tour would conclude in 9 days. They insisted I go into the store with them. Now, mind you, my expertise as a tour guide does not include minutiae about cellphones and SIM cards for foreign phones; it is limited of knowing which button to push to turn mine on and off. You waste your time on a tour on this to have a phone for 9 days? You can't use email? After the SIM card fiasco, we had to find a liquor store where one of the men had to purchase some other sort of phone card to call India. Remember the two little kids? They screamed the entire day. They youngest napped a little but the 5 year old did not. Why would anyone. . . ? It's none of my business, but. . . . .
At that point it was 7:00pm and I was paid only through 7:00pm. My cellphone, which has been giving me fits, crashed and I was late for my dinner with friends. I got paid off and out of the car and thankfully walked down the street to the Metro. They did thank me, but only verbally--no tip. The driver was left to have more time with them, as they demanded to be taken to an Indian restaurant across town when there was one across the street from where we parked by the liquor store. I entered the Metro, threw myself into a seat and heaved a sigh of blessed relief. My stomach was churning. I am sure they will be thrilled with their Wax Museum photos. I knew I would remember the Hotshot family group forever for all the wrong reasons--and for the fact that the situation was absolutely incredible and really quite funny in retrospect--but not when it was occurring. They seemed to have had a good time, but missed a lot of the good stuff in the uproar.